Epidural opiates offer new possibilities for perioperative analgesia. They may be used as a supplementation to anaesthesia, allowing reduced doses of anaesthetics for general anaesthesia and of local anaesthetics for epidural anaesthesia (n = 170). Combined epidural opiate anaesthesia with fentanyl is characterized by a remarkable hemodynamic stability. In comparison to systemic opiate application for surgical treatment, combined epidural opiate anaesthesia is characterized by immediate postoperative cooperation without pain and signs of respiratory depression. After epidural fentanyl application, CSF concentrations were 17 to 83 times higher than plasma levels (n = 11). In the postoperative period (n = 554), we prefer epidural morphine because of its long duration of action. If small doses of epidural bupivacaine are added, duration of analgesia is still more prolonged (by 50% as compared to epidural morphine alone), so that in most cases a single epidural injection allows sufficient analgesia for the whole postoperative period. Concerning the degree of pain reduction, the best results of epidural opiate analgesia were found after lower abdominal surgery. The reduced efficiency of epidural morphine after upper abdominal surgery may be overcome by additional small doses of local anaesthetics. 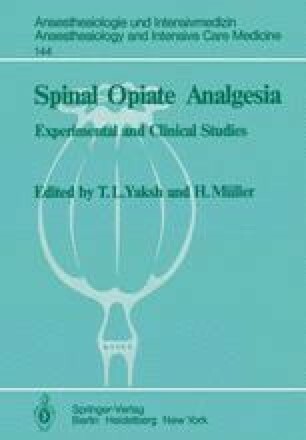 The volume, in which the opiate is diluted, as well as exact reference to the involved spinal segments were not as important as during epidural anaesthesia with local anaesthetics. High doses or repeated administration of epidural opiates in short intervals may cause early respiratory depression (by systemic absorption) or late respiratory embarrassment. The latter is probably due to spinal ascension of opiates in CSF but may also be explained by an abrupt release of high opiate concentrations via epidural veins into systemic circulation. Repeated intravenous naloxone injections are necessary to counteract late respiratory depression. During antagonization with a systemically applied antagonist spinal analgesia is not affected. Epidural naloxone may eliminate epidural opiate-analgesia for a short period of time (investigations with epidural or intravenous naloxone during epidural opiate analgesia: n = 10). Epidural opiate analgesia shortly after or in combination with systemic opiates should be avoided. On the other hand, the small doses of opiates for epidural analgesia following inhalation anaesthesia (n = 10) do not cause relevant respiratory or hemodynamic changes. Frequent side-effects could in part be prevented by additional drugs to the epidural opiate solution. A small dose of epidural droperidol avoids nausea and vomiting. Epidural local anaesthetics suppress itching in most patients. Urinary retention is not an uncommon side effect though diagnosis is easy, because strong pain impulses by extension of the bladder are not suppressed. Orthostatic collapse and allergic reactions are rare side-effects of epidural opiates.